Homespun Stitchworks..... For the love of vintage: Delicate embroidery on beautiful linen. I feel for my Summer picture/sampler that I would like to focus on flowers and bees this year having been watching these almost magical creatures, especially bumble bees who fly with those tiny wings from flower to flower with such large bodies is beyond me. They work tirelessly and little bits of lemon coloured pollen on their tiny feet, they fascinate me. Flowers for me if I choose them are the cottage garden variety, cornflowers, poppies, lupins, foxgloves, daisies, rosehips, old fashion roses that sort of thing so I am studying them to see how I can capture their essence but not in a formal way. The whole picture/sampler I would like to appear cottage garden on a warm summer day, that is what I am wanting portray. I have been looking at some of the vintage embroidery linens that I have and have decided even though they are outstanding I would like something a little less formal and a bit more naive in looks so I have been playing around on bits of linens with colours and stitches so that I can get the look I am after, basically what I can see in my head. 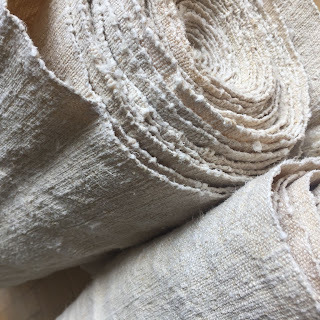 The linen that I am going to use is known as slubby linen which is a not so fine weave and a bit bumpy and old looking and I feel this is the right look for this theme I have going on in my imagination and in my doodles. I think this is the right kind of back drop for the picture I have in mind being that the linen I have is extremely old but not only that it gives it an authentic vintage feel with that kind of linen too. I love having my borders in our garden like a wild garden for bees and butterflies we do all we can to attract them to it and for the numbers to increase, this is the sort of garden I wish to stitch a cottage type garden with bees. I get up really close to them when they are collecting pollen and they seem to except me and my camera right now trying to capture their pollen covered feet and their dear little busy faces concentrating hard on what they are up to. Being as I want it to be a sampler like picture with words I am going to borrow Elizabeth Lawrence's words because I think they are perfect ... what do you think ? is the voice of the garden. Wishing that I could capture the smell of a summer wild garden in the warmth of the day and that is my goal with this sampler to evoke the imagination. So on a cold winters day you can look at this sampler and you can imagine what it feels like .... Setting my goal high here but that is what I am setting out to do. Getting out some of my beautiful antique paisley and old eiderdown fabrics and looking at the flower patterns has been a great source of inspiration and I am not going to lie now it has been fun looking through the fabrics and stroking them and staring at there faded beauty as well, all part of my job that I love so much. That rain last week did the garden some good and new flowers are budding and I have dead headed some to encourage new buds to grow, the bees are busy in the new little flowers and the just opening foxgloves that are still producing more. They have been out of the rain for days and now they are back with determination on their faces and I have been watching them with my early morning coffee. Well that is it for today so all that remains to say to you is have a wonderful day and I hope you all have a lovely time in our warm weather. Lovely ideas Sarah and such a beautiful butterfly brooch. Have you ever thought of basing one of your creations on a beautiful evening sunset? Thank you Dawn, the brooch is one of my favourites and very old with mother of pearl. I have thought, watched and photographed sunsets but not found a way I am happy with to capture one with a needle and thread in a naive way .. not given up yet though! Yes patience is required when snapping photos especially nature. I just keep snapping and generally out of every 4/5 photos you get a great shot! I only use two setting on my camera. Close-up when you can get in really close, and children which is designed for movement. Great setting ' children' very useful I can imagine with bees! How are you? recovered from the rescue I hope. I loved that verse so a second opinion is fabulous. Bees are extraordinary creatures I think especially the bumbles .. those tiny tiny wings with such a mass of body it makes me ponder how! Hope to see you soon, think I may see you at Wisborough.